And so begins the conclusion of our Iceland trip, which takes us out of the Westfjords and back to Reykjavik. For the previous updates you can read about Day 1 through Day 5 here and Day 6 through Day 10 here. With a full stomach from breakfast we prepared for our day on the road by returning to Gamla Bakery to pick up some food for lunch. We also didn’t know when we would see another gas station so we fueled up at the nearest N1 and decided to check the tire pressure. For a few days I have been thinking the tire felt off and it was 13PSI when the pressure should have been around 23! Having proper tire pressure was crucial for a day like we were about to have. The air machine was incredibly intuitive ( ) and helpful (more on the machine in the next post), something like this should at every gas station in North America. With everything in place we left Ísafjörður and headed into the unknown. Connected through a series of tunnels there are small communities outside Ísafjörður, which form up the municipality of Ísafjarðarbær. With a curiosity to see what a village of a few hundred looks like we did a little sightseeing in each as we went south in the Westfjords. We first went to Suðureyri, Flateyri and then Þingeyri. The weather was raining and windy so the thought of stopping to walk around wasn’t very appealing so what we did see was from the comfort of our car. The tour books didn’t have much to say about any of these towns so they may not be worth visiting again but a small town in an isolated region of the country will always have a certain quirkiness to it. From one town to the next our view of the landscape was hindered by the weather so we could barely see much of the water or mountain ranges, which was probably the biggest shame on this fjord exploration. To get to Dynjandi we took a “summer only” road (#60) and things on our trip started to get worse. The weather was still rainy and windy and the climb up this gravel road was terrifying with a single lane. There was terrible visibility, fog and sheer rock on one side and 15+ feet of snow on the other. This was a white knuckled experience and it felt dangerous to move the car out of the first gear. After what felt like hours navigating up and over Mount Kaldbakur we arrived at Dynjandi. The falls are impressive from the parking lot but we didn’t drive several hours in bad conditions to watch from afar so we put on our rain gear and prepared to get wet. The walk up was about 30 minutes to get the most accessible height of the falls. If we weren’t wet from the rain we would have been soaked by the water coming off the falls, and once you’re wet you’re wet so we tried to make the most of our time at this stop. It is too bad that what I remember most from Dynjandi, besides the weather, was the climb up and making sure not to take a wrong step. On better days I imagine Dynjandi would look beautiful. We returned to car, put the heat on and tried to thaw ourselves. We ate our Gamla Bakery lunch and headed out back on the road. We left Dynjandi around the same time as another vehicle and little did we know how much we would see that SUV for the next few days. Forty minutes on the road I pulled over a bit to let the SUV go by and the Hyundai couldn’t recover and get back on the road. I didn’t think I pulled over that much but I drifted the passenger side of the car into some soft gravel and came to a stop. I tried to reverse and go forward but nothing was happening. Thankfully the panic of “how we get out” didn’t last long as the SUV I pulled over for saw our predicament and came to push me out. 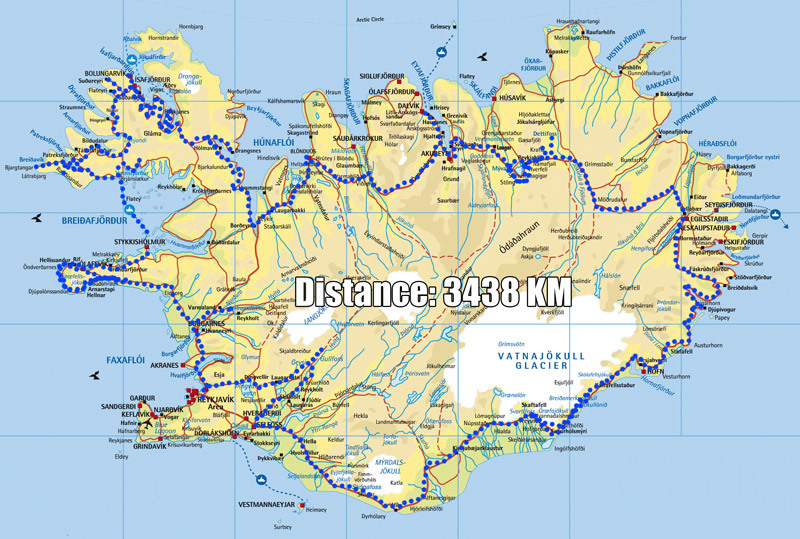 We created a little caravan together and when we landed on pavement at Tálknafjörður we went our seperate ways. We went in search of food and found a convenience store at Patreksfjörður where we bought dried cup of soup, cheese and crackers. Our journey was far from over as we still had at least an hour to go until we got to the guesthouse and that time estimate before we saw that the remainder of our journey was on rough gravel roads. The road (#62) to Breidavik would probably be fine in normal conditions but the days of rain had made it very tedious, especially after the roads we had seen today. There were large pot holes filled with water, parts of the road were underwater and on some sections of the road that hugged a large rock cliff there were actually boulders that had fallen on the road. This was the first time we saw a “falling rocks” sign actually be useful while driving. It felt like we were never going to get to our guesthouse but at 7PM we saw the Farm Holidays flag indicating a guesthouse and we knew this had to be us. On a normal day the drive would have been beautiful but today was one of the worst driving conditions I have ever experienced. One of the main attractions of Breidavik Guesthouse is the proximity to Látrabjarg cliffs. Not only is this the western most point in Iceland it is home to an incredible number of birds, specifically puffins. While not a priority for the trip when we left the cliffs gained a certain level of hype in my imagination and now that we were so close to them I had to get there. With our schedule being tight the next day to catch the ferry (leaves at 12PM with a two hour drive) we only had this evening to go to the cliffs. We had supper and waited for a bit before deciding to go back out again or not. Shortly after checking in the sun came out and it looked like a totally different day. We left for Látrabjarg at 8PM but when the road approached the beach we came across another hurdle for the day. The sandy road appeared to be under a bit of water and there was no easy way to drive around it. You only want things you can’t have and to be this close to the cliffs but foiled by water was frustrating. Not wanting to get stuck for the second time that day we decided to return back to the guesthouse. On our way back we saw our couple in the SUV that pushed us out of the road drive to the cliffs, as well as a smaller car than ours. For the rest of the night we wondered if either vehicle had any problems getting through the water or any other issues further along. Back at Breidavik Guesthouse for the night we walked around the beaches, drank wine and did research while unwinding from this bad weather day. Breidavik has a run down appearance when you pull in but don’t pass up on it. The large house looks neglected and the white canisters of rooms in the back look like compartments for live stock. However, you don’t judge a book by its cover as the interior of the reception/dining area was very nice and comforting. At the reception there were guests and, I assume, locals enjoying the company of each other in the lounge area. The compartments we slept in were very comfortable and cozy. They may not look like much from the outside but the inside had private bathrooms, large windows looking out to the beach, two comfortable beds and a mini kitchen complete with a kettle; which was critical since we bought dried noodle soup earlier in the day. This was a very nice guesthouse that was clean and functional. The beds were soft and the roll shutters blocked out all of the light. Breakfast was the same of what we have had on the trip with cereal, yogurt and cold cuts. They were the first place to not have a toaster available but they did have peanut butter, so we felt it was a fair trade. We woke up at 7AM after having a solid sleep. Breakfast was busy (the spread is reviewed above) with others and there was talk of those who went to the cliffs last night and commented on how active the puffins were. Our SUV couple made it through, as did the small car, and both spent several hours last night there. We planned to catch the ferry at 12PM and with a two hour drive on roads that may not have improved since yesterday there wasn’t much time for sightseeing or a chance to go to the Látrabjarg cliffs so we packed up and hit the road. Our drive out took us by a turn off towards a 10KM stretch of beautiful red beaches called Rauðisandur. If we couldn’t see Látrabjarg we felt this was a good consolation prize. The gravel road up and over the mountain was a slow 10KM that took us nearly 20 minutes. Only having an hour to spare this didn’t leave us much time to explore when we arrived at Rauðisandur. This was definitely a regret on our trip and wished we could have seen more of it, especially when we looked at photos online of what the view looked like further down, but we had a time limit today and didn’t want to be late for the ferry. Even stopping to photograph a rusted ship was timed. Once we landed on paved road I sped and rushed to the Baldur Ferry area. We arrived around 11AM and noticed that the ticket office was closed so we went to a nearby house to ask about information. We were told that the ferry departs once a day and it leaves at 6PM instead of noon. What?! Our whole day was turned upside down. We called our tour guide with Iceland Unlimited and tried to sort this out. There was a misunderstanding in summer hours (starts in June instead of May) and this is why we were given the wrong time, even though everyone at Breidavik said it left at 6PM we thought we were on an earlier ferry. We discussed itinerary change options (ie: extra day in the Peninsula and one less day in Reykjavik, etc.) but he said he would call back with options. The nearest attraction by Baldur Ferry is the Vatnsfjörður Nature Reserve, which we headed to to pass time until we heard back from Iceland Unlimited. We weighed our options and when our tour guide called back we decided to make no changes and just suffer with a late night tonight. Iceland Unlimited would pay for after hour car drop off since any sightseeing we didn’t do today would be done tomorrow and put us back in Reykjavik well after the originally proposed 5PM drop off time. With a whole afternoon open we took a few minutes to pose in front of a beautiful waterfall we found by the Nature Reserve. When I saw a sign for Látrabjarg I did another “super sad” face. With that out of our system we carried on with our day and did some exploring under beautiful blue skies. Lunch was approaching so we returned to Patreksfjörður (60KM away), bought some food and enjoyed it overlooking the fjord. After a rough day on the road yesterday we gave the car some attention by checking the tire pressure and washing the mud out of the rims that was still there after getting stuck the day before. We now had over five hours to pass so we took our time and tried to see what we missed with bad visibility yesterday and the difference was remarkable. The Westfjords transformed from a gloomy world into a beautiful world with rich blue water and inspiring vistas between fishing villages. At low tide we walked onto the beach and remarked that mountains and waters felt like something you would see in a tropical place and it turned out that the ferry time mix up gave us some of our best memories of Iceland. With the afternoon sufficiently passed we headed to the Ferry and saw our SUV friends. We talked about our respective days and they showed me photos of the puffins they got the previous night and from that morning. My jealousy is high but it was interesting to see their photos and how close they were able to get to the puffins. When we return to Iceland we’ll be in a larger vehicle and make the Westfjords a top priority, especially Látrabjarg. The ferry was over two hours long, complete with a stop over in Flatey. We stayed above deck for the first half of the trip but with a rushed schedule we had to prioritize what to see today and tomorrow so we went down below to plan, warm up and have some supper. The ferry arrived at Stykkishólmur on the Peninsula and we entered “super duper tourist sight seeing” mode. Unfortunately we missed some of the sights and the relaxing pace we were used to but we tried to make the most of our time on the Peninsula. We arrived at Guesthouse Hof shortly after 11PM and were given our own building because they didn’t want us disturbing anybody by coming in late. We knew there were hot tubs at this guesthose and have been saving a bottle of sparkling wine for this moment ( ) for the last few days and it did not disappoint. We must have spent 90 minutes in the hot tub listening to the ocean waves in the distance, watching the birds fly in the sky, all the while seeing a beautiful pink sunset over the Snæfellsjökull range. It was well passed midnight and was still very light outside. It isn’t possible to capture how amazing this experience was but this video I took helps show the kind of view we had from the hot tub. Guesthouse Hof was a very large accommodation and in a great location. We were fortunate to have a place all to ourselves and this definitely made us enjoy the stay a little more. There are many sleeping areas, even a loft above the kitchen, and had a large living room with clean bedrooms. The location is ideal being on the southern side of the Peninsula and it was relatively easy to navigate around and get back to the northern part of the Peninsula. Breakfast was delivered to our room and outside of the photo I took of it I can’t recall anything particular about it. It was an average spread, better than some places but not the best. It filled us up and that’s all you can ask. We were slow to start the morning because of the late night we had, but with a full day we didn’t delay for long and were mobile around 7:30AM. To see sights we missed yesterday we back tracked and took a short cut through the Peninsula and started going counter clockwise on the Peninsula at Ólafsvík. Our first stop on exploring the Snæfellsnes Peninsula was to the Caribbean like beaches of Skardsvik. The entire area of Snæfellsnes Peninsula is covered with lava flow from past eruptions and then out of the black and grey is this view you wouldn’t think to ever see in Iceland with gold sand and blue waters. Epine, a ship from England, ship wrecked on the beaches of Djúpalónssandur back in 1948 is still visible on the sand. Most of the boat has been worn away over years from the elements but you walk on the beach and can still see large chunks of twisted and rusted metal. We walked amongst the ruins, explored the rocks and built a stone monument on the beach. Although Drivtik is in the same area as above I’m separating this out because it deserves special attention. Further down from the ship wreck we were on the beaches of Drivtik. Jenna called this the highlight of the trip and one of the most beautiful places she’s ever seen, and I’m inclined to agree with her. Stones turned into small rock to small pebbles the closer to the water you got and all the while they were jet black and smooth. Water would crash in, causing the rocks beneath to make a loud crunching sound, the water would pull away exposing exposing wet rock and come in again. It was very mesmerizing and we must have stood here for over 10 minutes just watching. Beyond that was a sea stack to one side, cliffs on the other and endless water beyond. Across from the bird cave of Badstofa, by Hellnar is a little cafe called Fjoruhusid. We had lunch on the patio and enjoyed doing people watching and see the activity by the bird cave. For lunch we had seafood soup and it was so delicious it claimed the spot of second best on the entire trip. First place went to the lamb soup at Gullfoss cafe and third was tomato and basil from Dimmuborgir. For desert we shared a Skyr cake and were ready to carry on our busy day of sight seeing. Our way to Reykjavik was full of attractions and once we were off the Peninsula we headed to Hraunfossar Falls. Arriving here was a bit tricky as we took a wrong turn and ended up driving on gravel for over 45 minutes. We returned to the main road and not more than a few kilometers from where we prematurely turned off to the access for Hraunfossar Falls. This was our last waterfall on the trip and it’s a pretty unique by covering nearly a kilometer of distance and water cascaded down from lava formations. We knew we weren’t in a rush to return the car to Reykjavik but we saw as much as our tired bodies would carry us, got in the car and started on the last two hours of our drive around the country. To speed up our return we spent the 1000ISK ($7.82CDN) to go on the Hvalfjörður Tunnel, which goes under the fjord and allows you to greatly reduce your travel time. Thankfully this tunnel was multiple lanes and carried traffic in both directions. With the assistance of our GPS, “James”, we were able to get into the heart of Reykjavik and check in at the Salvation Army Guesthouse. We emptied the car, changed clothes from 12 hours on the road and took the Hyundai back to the rental agency, ProCar, which was just over a 1KM so we could easily walk back after returning the car. Our Hyundai i30 was good to us. Overall we travelled 3438 km in it and thankfully didn’t return it with any dings, scrapes or serious damage. After a few hot dogs on the road we finally went to the best hot dog stand in the world, Bæjarins Beztu Pylsur. I had two with everything and loved it. Jenna wasn’t convinced by its greatness and thought the first hot dogs we had by the Reykjavik square (Ingolfstorg) on our first day were better but I couldn’t agree with this. Most of the hot dogs in Iceland are similar with being made from lamb, but these ones were special because of the toppings. I have eaten a lot of hot dogs in my life but these two stand out as the best ever. We were put up in a different area of the Guesthouse so we weren’t exposed to as much noise coming from the Reykjavik square (Ingolfstorg) but there was still traffic noise but after a long couple of weeks we had no problems sleeping. My opinions of the Salvation Army Guesthouse remain unchanged, it looks dirty and feels more like a hostel than a guesthouse, however it’s close to amenities of down town Reykjavik so it is the price you pay for convenience. The day started with a small breakfast ( ) by what we are used to, however it was average for what you can expected at the Salvation Army Guesthouse. Today was a full day in Reykjavik so we layered up, packed light and began exploring. We wandered up streets, did window shopping, walked through parks and eventually made our way up to Hallgrímskirkja. We explored the grounds and went inside to look at the 15 meter tall organ inside as well as the architecture inside the church. We window shopped and just wandered the streets. For an afternoon pick me up I had another “one with everything” hot dog from Bæjarins Beztu Pylsur followed by chocolate dipped ice cream. The weather was amazing with the sun out and hardly a breeze. In the two weeks we were on the road Reykjavik started to explode with color as plants and flowers began to bloom. It was nice to wander the city feeling comfortable with where everything was located and knowing you weren’t on a time schedule. A full day on our feet meant a large meal and for that we went to the Reykjavik Restaurant for the fish buffet ( ). This was a little expensive at 5300ISK/person ($41.50/person) but we at a lot of different fish we wouldn’t have tried otherwise so it was a justified expense. We returned back to the Salvation Army Guesthouse and finished the last bits of wine we had and started to reminisce about the trip and prepare to pack up to leave tomorrow. A slow start to the day but our bus ride to the Blue Lagoon came for us at 10:30 so following another disappointing breakfast we still had 90 minutes to pack everything up. Packing was a simple process, since we have essentially been packing and unpacking our suitcase every day so we were pretty efficient at doing it one last time. We arrived at the Blue Lagoon around 12PM and with our shuttle to the airport leaving at 2PM we only had 90 minutes to enjoy the Lagoon and that wasn’t nearly enough time. The admission was fairly steep at 35€/person ($45 CDN/person) but had we been able to stay a little longer we may have been able to get our monies worth. However, it was nice to be fully relaxed and mellow before getting on a long flight back home. We explored the pool in search of warm vents. Put on several applications of silica mask cream (available for purchase here, the fact they can charge $100USD for a bottle is sad but it really worked, our skin felt great for days after) from the buckets stations set up around the lagoon. Unlike Lake Myvatn Nature Bath there were more areas to explore in the warm water plus multiple steam rooms and hot tubs you could go in to. It was nice to have been to the Lake Myvatn Nature Bath to compare to the Blue Lagoon, they each have their benefits and I would gladly return to both. We were on our shuttle to Keflavik Airport at 2PM and so ended the best trip I have ever experienced. Our trip back to Edmonton, by way of Seattle, was uneventful, and that concludes our trip. I have a final post to publish that talks about things we learned on the road that may be useful to others visiting Iceland. I enjoyed reading your blog. We’re going to be doing a 10-day Westfjords excursion of our own this coming late June/early July. I got a great deal (by Icelandic standards) on an I30 rental, which well use to traverse Road 60 from North to South in it, so your article is right on point. Needless to say, I don’t like heights too much, so I’m somewhat concerned about using a 2wd I-30 on Road 60, given all the gravel and potholes I’ve read about as well as the lack of guardrails. On the plus side, we’ll be able to take our time and the weather should be okay at that time of year, unless we have a lot of rain and fog. Last time I was in Iceland, I rented a 4wd Suburu Legacy. Took it onto a F road by mistake (Jökulhálsleið), because it was marked as an F road. The 15+ year old Legacy’s brakes left a lot to be desired, so it was quite an experience. I’m hoping that the I30 will be adequate, since I’d hate to spend thousands more on 4wd + gas just so I can feel more secure on Road 60 and 62/612 for the relatively brief time we’re on both. Correcting some typos . . . I enjoyed reading your blog. We’re going to be doing a 10-day Westfjords excursion of our own this coming late June/early July. I got a great deal (by Icelandic standards) on an I30 rental, which we’ll use to traverse Road 60 from North to South, so your article is right on point. Last time I was in Iceland, I rented a 4wd Suburu Legacy. I took it onto a F road by mistake (Jökulhálsleið), because it wasn’t marked as an F road. The 15+ year old Legacy’s brakes left a lot to be desired, so it was quite an experience. Hi Jack – Thanks for reading and your comment. You have valid concerns and regardless the time of year you go guardrails and potholes may be an issue (Westfjord pot holes just seemed bigger than anywhere else on the island) but the ‘summer road’ will have been open for a few months and that will probably make the biggest improvement in your experience over mine. The roads got exponentially worse during the rain but we noticed that conditions by Breidavik improved dramatically even after a few hours of good weather so if you do get a bit of rain the sun should help you and you will be able to take 6, 62/612 without incident. Good luck on your trip, 10-days in that isolated area will be incredible and you will certainly be able to cover that whole area and then some in that time.